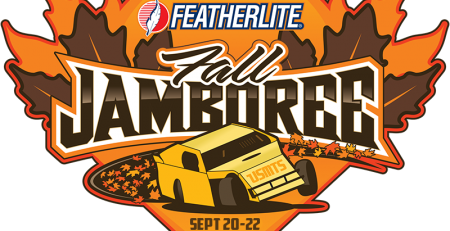 Less than a month ago, Kadden Kath repaid a favor to fellow Out-Pace USRA B-Mod competitor, and Saturday night the racing gods rewarded Kath with a victory at the 20th Annual Featherlite Fall Jamboree and a $1,700 paycheck to go with it. Battling for the track championship at the Deer Creek Speedway on the final Saturday of August, Kath made a last-lap pass to earn a tie atop the division’s points standings with Jim Chisholm, but based on his better season win total Kath was awarded the title. Kath, however, asked officials if the title could be shared with Chisholm and his wish was granted. Earlier that day, Chisholm’s team had helped Kath change a flat tire on his car. Had the Chisholms not done so, the title would have been theirs outright. Running second in Saturday’s main event when the yellow flag waved with two laps to go, Kath threw a “slide job” at race-long leader Ben Moudry when the green flag returned. He squeezed in front of Moudry, took the lead and then held on to take the win. Moudry’s valiant effort ended with runner-up honors while Iron Man Challenge points leader Dan Hovden followed closely in third with Dakota Foster and Andrew Schroeder in tow for fourth and fifth. The winner’s older brother, Kylie Kath, claimed the sixth spot, Trevor Fecht was seventh, Jerry Young finished eighth, Jared Boumeester wound up ninth and Corey Jones was tenth. Jones, whose father won the USMTS Modified feature at the first Fall Jamboree in 1999, collected an extra $300 as the race’s hard charger. He started on the outside of the seventh row in the three-wide starting field. Up next for the Iron Man Challenge is the 5th Annual Summit USRA Nationals on Thursday, Friday and Saturday, Oct. 4-6, at the I-35 Speedway in Winston, Mo. The Holley USRA Stock Cars presented by Medieval Chassis will also be in action for the Iron Man finale, along with USRA Modifieds, Cook Racing Supplies USRA Hobby Stocks and USRA Tuners. This event is sanctioned by the United States Racing Association and all USRA rules apply. USRA national points will be awarded with a true car count bonus (minimum 48 points). All drivers must have a valid USRA license (no temps). RACEceivers and transponders are required and will be available for rent or purchase. 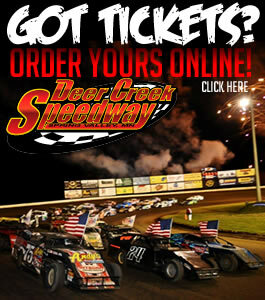 Entry fees are $100 for Modifieds, $75 for Stock Cars and B-Mods and $50 for Hobby Stocks. There is no entry fee for the Tuners which race Friday and Saturday only. The entry form can be downloaded at www.usraracing.com/ClientFiles/Downloads/EntryForms and has rules, times, payouts and other event information. Entry fee and completed entry form must be received by Sept. 28. Entry fees are double after Sept. 28. 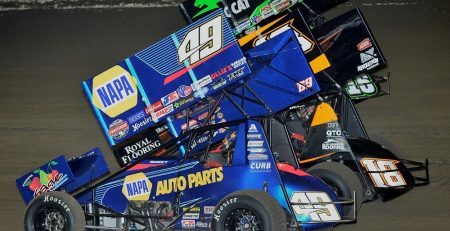 Showing finishing position, starting position in parentheses, car number, driver, hometown, chassis/engine builder, laps completed and money won. The top 15 in heat race passing points advance to the “A” Main with the top 9 redrawing for the first 9 starting spots. 1. (1) 16 Dan Hovden, Decorah, Iowa. 2. (5) 51W J.T. Wasmund, Pine Island, Minn.
3. (2) 6 Dustin Kruse, Brandon, S.D. 4. (3) 782 Miah Christensen, Sioux Falls, S.D. 5. (6) 36K Jayden Larson, Mankato, Minn.
6. (8) 98 Kyle Anderson, Decorah, Iowa. 7. (4) 02K Hunter Kennedy, St. Ansgar, Iowa. 8. (7) 4W Tucker Williams, Rochester, Minn.
9. (9) 55 Brody Shaw, Brownsdale, Minn.
1. (2) 02X Andrew Schroeder, Fremont, Iowa. 2. (8) 85 Ben Moudry, Hastings, Minn.
3. (1) 00 Devon Schlumbohm, Sioux Falls, S.D. 4. (5) 49 Nate Whitehurst, Mason City, Iowa. 5. (3) 43 Zach Brom, Winona, Minn.
6. (4) 95X Shaun Walski, Winona, Minn.
7. (7) 33S Dustin Steinbrink, Austin, Minn.
8. (6) 30V Dustin Von Hagen, Glenville, Minn.
9. (9) 44 Aaron Wiersma, Sioux Falls, S.D. 2. (2) 53 Tianna Mithun, New Richland, Minn.
3. (6) 10T Trevor Fecht, Allison, Iowa. 4. (4) 17B Zach Benson, Princeton, Minn.
6. (3) 83 Billy Steinberg, Kasson, Minn.
7. (7) 66 Darin Noyes, Sioux Falls, S.D. 8. (8) 2 Brandon Maitland, Waterloo, Iowa. 9. (9) 8 Dan Lewison, Dexter, Minn.
1. (2) 5 Dakota Foster, Gardner, Kan.
2. (1) 13X McKenzie Gerdes, Villard, Minn.
3. (4) 26G Ryan Gierke, Villard, Minn.
4. (5) 7J Cory Jones, Zimmerman, Minn.
6. (6) 27X Kevin Joachim, Larchwood, Iowa. 7. (8) 476X Troy Hovey, Castalia, Iowa. 8. (3) 28S Spencer Stock, Eyota, Minn.
1. (3) 81 Jared Boumeester, Waseca, Minn.
2. (8) 83X Kadden Kath, Owatonna, Minn.
3. (6) 22P Steve Amundson, Owatonna, Minn.
4. (1) 38S Cole Lonergan, Dexter, Minn.
6. (4) 60 Colby Mann, Caledonia, Minn.
7. (2) 11 Jake Masters, Graettinger, Iowa. 8. (5) 99 Noah Grinstead, Austin, Minn.
1. (5) 83 Kylie Kath, Owatonna, Minn.
3. (4) 55H A.J. Hoff, Mantorville, Minn.
4. (1) 7C Cole Christensen, Sioux Falls, S.D. 5. (7) 75 Cole Suckow, Cresco, Iowa. 6. (6) 26 Abby Gierke, Villard, Minn.
7. (8) 41 Thor Anderson, Rock Valley, Iowa.8. (2) 24 Tanner Johnston, Hayfield, Minn.
1. (3) 30 Scott Demmer, Ellendale, Minn.
2. (7) 27 Channing Warner, Owatonna, Minn.
3. (5) 7+ Jared Timmerman, Norwalk, Iowa. 4. (8) 23B Britt Olson Jr., Waseca, Minn.
5. (2) 17 Justin Murray, Owatonna, Minn.
6. (6) 955 Lucas Grusinger, Chaska, Minn.
7. (4) 50 Robert Dose, Whitmore, Texas. DQ – (1) 66L Levi Chipp, Latimer, Iowa. 1. (1) 12K Casey Knutson, Spring Grove, Minn.
2. (5) 30R Josh Ruby, Lakota, Iowa. 3. (7) 4 Ryan Maitland, Waterloo, Iowa. 5. (8) 88X Jimmy Broszeit, Postville, Iowa. 6. (2) 73 Kenny Boge Jr., Orchard, Iowa. 7. (6) C3 Chad Staus, Otterville, Mo. DQ – (3) 15 Zach Elward, Hayfield, Minn.
1. (1) 10T Trevor Fecht, Allison, Iowa. 2. (11) 476X Troy Hovey, Castalia, Iowa. 3. (6) 24C Jim Chisholm, Osage, Iowa. 4. (7) 36K Jayden Larson, Mankato, Minn.
5. (16) 15 Zach Elward, Hayfield, Minn.
6. (12) 33S Dustin Steinbrink, Austin, Minn., $75. 7. (2) 13X McKenzie Gerdes, Villard, Minn., $75. 8. (9) 83 Billy Steinberg, Kasson, Minn., $75. 9. (5) 38S Cole Lonergan, Dexter, Minn., $75. 10. (15) 99 Noah Grinstead, Austin, Minn., $75. 11. (3) 26G Ryan Gierke, Villard, Minn., $75. 12. (10) 26 Abby Gierke, Villard, Minn., $75. 13. (8) 17 Justin Murray, Owatonna, Minn., $75. 14. (13) 50 Robert Dose, Whitmore, Texas, $75. 15. (18) 8 Dan Lewison, Dexter, Minn., $75. 16. (4) 88X Jimmy Broszeit, Postville, Iowa, $75. 17. (14) 30V Dustin Von Hagen, Glenville, Minn., $75. DNS – 00 Devon Schlumbohm, Sioux Falls, S.D., $75. 1. (1) 22P Steve Amundson, Owatonna, Minn.
3. (5) 782 Miah Christensen, Sioux Falls, S.D. 4. (7) 56H Brandon Hare, Elma, Iowa. 5. (4) 49 Nate Whitehurst, Mason City, Iowa. 6. (9) 98 Kyle Anderson, Decorah, Iowa, $75. 7. (2) 7+ Jared Timmerman, Norwalk, Iowa. 8. (10) 27X Kevin Joachim, Larchwood, Iowa., $75. 9. (14) C3 Chad Staus, Otterville, Mo., $75. 10. (15) 2 Brandon Maitland, Waterloo, Iowa, $75. 11. (12) 41 Thor Anderson, Rock Valley, Iowa, $75. 12. (8) 43 Zach Brom, Winona, Minn., $75. 13. (13) 66 Darin Noyes, Sioux Falls, S.D., $75. 14. (16) 55 Brody Shaw, Brownsdale, Minn., $75. 15. (11) 955 Lucas Grusinger, Chaska, Minn., $75. 16. (6) 7C Cole Christensen, Sioux Falls, S.D., $75. DNS – 24 Tanner Johnston, Hayfield, Minn., $75. 1. (6) 02 Cole Denner, New Hampton, Iowa. 2. (4) 7J Cory Jones, Zimmerman, Minn.
3. (3) 6 Dustin Kruse, Brandon, S.D. 4. (5) 17B Zach Benson, Princeton, Minn.
5. (15) 66L Levi Chipp, Latimer, Iowa. 6. (1) 53 Tianna Mithun, New Richland, Minn., $75. 7. (7) 75 Cole Suckow, Cresco, Iowa. 8. (16) 44 Aaron Wiersma, Sioux Falls, S.D., $75. 9. (11) 73 Kenny Boge Jr., Orchard, Iowa, $75. 10. (14) 4W Tucker Williams, Rochester, Minn., $75. 11. (2) 23B Britt Olson Jr., Waseca, Minn., $75. 12. (12) 02K Hunter Kennedy, St. Ansgar, Iowa, $75. 13. (10) 60 Colby Mann, Caledonia, Minn., $75. 14. (9) 95X Shaun Walski, Winona, Minn., $75. 15. (8) 19 Ryan Siegle, Rochester, Minn., $75. 16. (13) 11 Jake Masters, Graettinger, Iowa, $75. DNS – 28S Spencer Stock, Eyota, Minn., $75. 1. (2) 83X Kadden Kath, Owatonna, Minn., 20, $1700. 2. (1) 85 Ben Moudry, Hastings, Minn., 20, $900. 3. (11) 16 Dan Hovden, Decorah, Iowa, 20, $600. 4. (7) 5 Dakota Foster, Gardner, Kan., 20, $600. 5. (5) 02X Andrew Schroeder, Fremont, Iowa, 20, $400. 6. (3) 83 Kylie Kath, Owatonna, Minn., 20, $350. 7. (16) 10T Trevor Fecht, Allison, Iowa, 20, $400. 8. (12) 18Y Jerry Young, Blooming Prairie, Minn., 20, $275. 9. (4) 81 Jared Boumeester, Waseca, Minn., 20, $250. 10. (21) 7J Cory Jones, Zimmerman, Minn., 20, $525. 11. (19) 476X Troy Hovey, Castalia, Iowa, 20, $300. 12. (8) 51W J.T. Wasmund, Pine Island, Minn., 20, $190. 13. (10) 30R Josh Ruby, Lakota, Iowa, 20, $180. 14. (6) 27 Channing Warner, Owatonna, Minn., 20, $275. 15. (15) 15W Alex Williamson, Rushford, Minn., 20, $170. 16. (23) 782 Miah Christensen, Sioux Falls, S.D., 20, $165. 17. (17) 22P Steve Amundson, Owatonna, Minn., 20, $160. 18. (25) 36K Jayden Larson, Mankato, Minn., 20, $155. 19. (22) 24C Jim Chisholm, Osage, Iowa, 20, $150. 20. (20) 55H A.J. Hoff, Mantorville, Minn., 20, $150. 21. (24) 6 Dustin Kruse, Brandon, S.D., 20, $150. 22. (26) 56H Brandon Hare, Elma, Iowa, 20, $150. 23. (30) 66L Levi Chipp, Latimer, Iowa, 20, $150. 24. (27) 17B Zach Benson, Princeton, Minn., 20, $150. 25. (31) 7+ Jared Timmerman, Norwalk, Iowa, 20, $150. 26. (32) 75 Cole Suckow, Cresco, Iowa, 20, $150. 27. (29) 49 Nate Whitehurst, Mason City, Iowa, 20, $150. 28. (9) 30 Scott Demmer, Ellendale, Minn., 20, $150. 29. (13) 12K Casey Knutson, Spring Grove, Minn., 18, $150. 30. (18) 02 Cole Denner, New Hampton, Iowa, 18, $150. 31. (28) 15 Zach Elward, Hayfield, Minn., 4, $150. 32. (14) 4 Ryan Maitland, Waterloo, Iowa, 0, $150. Lap Leaders: Moudry 1-18, Kadden Kath 19-20. Total Laps Led: Moudry 18, Kadden Kath 2. Margin of Victory: 0.515 second. Time of Race: 13 minutes, 48.924 seconds (5 cautions). Iron Man Challenge Points: Hovden 1355, Moudry 1215, Suckow 946, J. Christensen 825, Timmerman 771, C. Christensen 746, Chisholm 653, Kruse 557, Williamson 545, Denner 543.